‘Yet another tough decision for Rafa..’ – NUFC blog – Newcastle United blog – NUFC Fixtures, News and Forum. In 2003 Aron Ralston was hiking down a trail in Colorado when an 800 pound boulder he was climbing over, shifted, trapping his arm. He remained trapped there for 5 days before, in sheer desperation, he deliberately broke his own arm so that he could then free himself by amputating it with a small penknife. Can you imagine having to break your own arm, and then start hacking through it with a small blade? I’m sure that if you are facing death the decision may possibly be a little more straightforward, but nonetheless, the pain must have been excruciating. In 1972 a chartered aircraft from Uruguay, carrying an amateur rugby team, family and friends, crashed on a glacier in the Andes. The only way the survivors could continue to survive was by eating the bodies of those who had died in the crash, and then those who had survived, but then subsequently died in an avalanche. The bodies were eaten raw. Uncooked. I’ve eaten some serious stuff in my times overseas and putting myself in their position I could probably force down the odd spoonful of Rodriguez Ratatouille or a bite of a well cooked Parrado Pastie but take me into a Sushi restaurant and there’s an awful lot of raw fish left on the plate at the end of the meal. Tell me that the only way I’m going to survive is by eating the guy in seat 4C raw , and it’s a bit of a tricky one, even if he was playing his Walkman too loud. In 1973 my dad married my Step Mother, to whom we affectionately referred as the Wicked Witch Of The North. Many years later he admitted that had he known how things would ultimately turn out he would have reconsidered, but he claimed in his defence that he honestly believed that we needed a mother figure in our lives. Personally I’m more inclined to believe that he was looking after his own needs, rather than ours. I appreciate that he was lonely, but he wasn’t faced with imminent death, so in my mind, there was no excuse. With decision making skills like that it’s no wonder mother left him. When writing out the team sheet this week Rafa Benitez will have to decide whether he goes with Salomon Rondon up front, or should he opt instead for Joselu. Yes, Rafa has to make some difficult decisions. Does he put Dubravka in goal or go with Darlow? Does he play 8 at the back, or try a more adventurous and attacking formation and only use 7? A bit like his decision to stick out his contract after our “disastrous” January transfer window. A decision that I suspect would have been sweetened more than a little by the notifications of the arrival of text messages from the bank, telling him that his latest salary has been deposited. Some decisions are a bit easier when you’re bank account is increasing at a rate of ten quid every minute of every day. There’s a competition format in golf that restricts the players to only 4 clubs instead of the usual 14, and players are often surprised at how well they can do with this restriction placed on them. It’s simply down to the fact that the decision making is taken away from the player. Should I use a 5 iron, a 4 iron or even my 5 wood? What’s in the bag? Uhh. The 5 wood it is then! In t’ good old days, before the advent of chemicals or the government paying them not to do anything, farmers would approach the planning of their crops from a more studious aspect. A particular crop would remove certain nutrients from the soil while depositing others. If you went with this crop too many times the nutrient content of the soil became exhausted. To try to make best efficient use of the soil, the next season, the farmer would plant a different crop. One that would grow better in those conditions. This would again change the soil content and the next season he would grow something else. So, for example, maybe he’d start with wheat, then possibly corn, then he’d grow cows, and the next year tinned peas. This would also help counter infestations and blight. When he was running a professional organization Rafa had a similar approach to his squad. To prevent exhaustion and injury a player that Newcastle fans would give their right arm for (or possibly Aron Ralston’s right arm) would sit out the odd game because Rafa had at his disposal a depth of quality found nowhere else outside a “Sports Direct reject bin”. I suppose you can do that when you are at Liverpool, Chelsea, and Real Madrid. However – at Newcastle, to use the golfing metaphor – it’s more of a 4 club competition, and the decisions are more easily arrived at. Or if Rafa was a farmer, let’s just say he’s limited to trying to grow the vegetables he’s got. Rondon or Joselu? Hardly up there with sawing your arm off or eating your sister. While the local rags typically misconstrue Rafa’s comments to mean that he want’s to stay with Newcastle for the next 10 years, I go with the more literal interpretation, you know, actually reading the words, and suspect that he was putting the rest of the Premiere League on notice that he’s available at the end of the season. 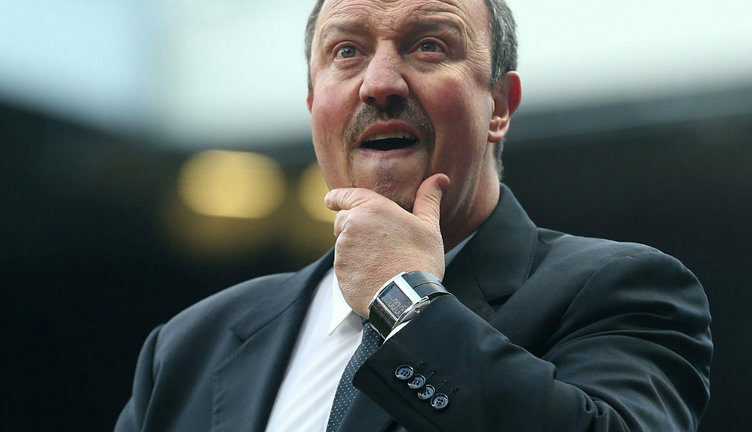 With his other teams Rafa has been a hero too, but after a while he has dropped out of favour. As fans, we are pretty much bipolar. We either love them or we hate them – players too! He’s had a good 3 years but his history and our hormones might suggest that this is a good time to leave. I personally hope that Rafa gets what he wants and signs on but as a realist I ask myself why would such a talented, in demand individual sign a new contract having experienced the levels of disrespect and manipulation that he has from the owner? It just doesn’t make sense. There again – I wasn’t expecting my dad to marry the Wicked Witch of the North, so what do I know?